TOOLING AND WORKHOLDING Modern Machine Shop 121 Workholding System Increases Vacuum Surface Area for Milling Fixtures Technical Tooling's Vacu-Grip composite workholding system vacuums milling fixtures by using a granular media technol- ogy that configures to any complex three-dimensional shape and pulls a vacuum across the entire surface area of the part. The increased vacuum surface area and surface fric- tion is said to double the holding strength over conventional grooved vacuum tooling. 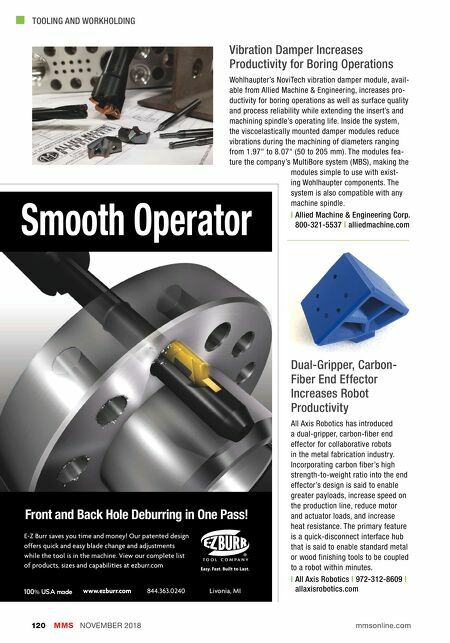 The system decreases milling fixture lead times, elimi- nates toolpath interference, reduces scrap rates, produces holding force on the entire surface area, speeds part and tool change-over, and has a wide range of size and geometric capabilities. 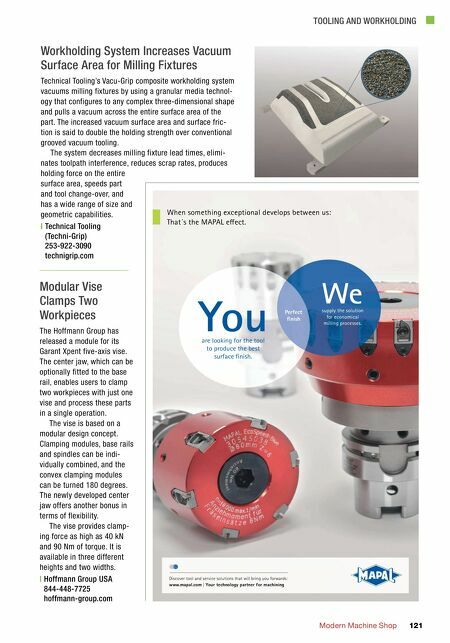 | Technical Tooling (Techni-Grip) 253-922-3090 technigrip.com Modular Vise Clamps Two Workpieces The Hoffmann Group has released a module for its Garant Xpent five-axis vise. The center jaw, which can be optionally fitted to the base rail, enables users to clamp two workpieces with just one vise and process these parts in a single operation. The vise is based on a modular design concept. Clamping modules, base rails and spindles can be indi- vidually combined, and the convex clamping modules can be turned 180 degrees. The newly developed center jaw offers another bonus in terms of flexibility. The vise provides clamp- ing force as high as 40 kN and 90 Nm of torque. It is available in three different heights and two widths. | Hoffmann Group USA 844-448-7725 hoffmann-group.com We You Perfect fi nish supply the solution for economical milling processes. are looking for the tool to produce the best surface fi nish. Discover tool and service solutions that will bring you forwards: www.mapal.com | Your technology partner for machining When something exceptional develops between us: That´s the MAPAL eff ect.